Beautiful certificate from the New England Piano Company issued in 1899. This historic document has an ornate border around it with a vignette of the company's headquarters. This item has the original signatures of the Company’s President, Thomas F. Scanlan and Treasurer, and is over 113 years old. Professional and industrial history of Suffolk County, Massachusetts (Volume 3). 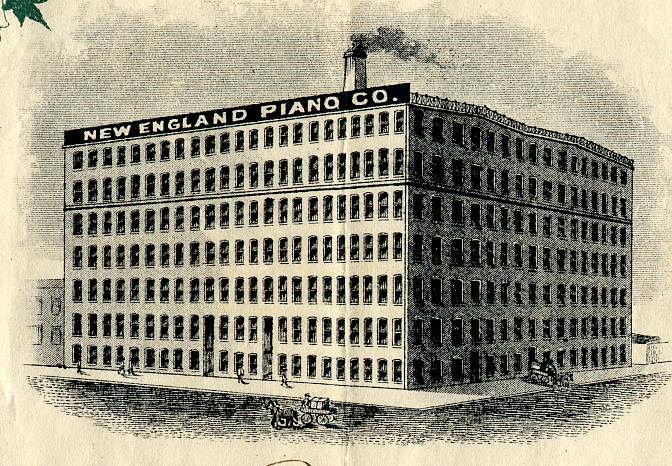 The first piano made by the New England Piano Company was completed in June, 1881. Thomas F. Scanlan, the company's president, had started making two to three pianos a week. About a year and a half later he secured his present location on George street, in Boston, with greatly increased manufacturing capacity. From this time forward the growth of Mr. Scanlan's business has been very rapid. Additions to his manufacturing plant have been made from time to time until the present structure is numbered among the largest and best equipped establishments of its kind in America. The main edifice fronts on three streets, and is seven stories in height, the total floor space utilized being more than six acres. Mr. Scanlan is sole proprietor of this concern, which his activity, push and enter- prise have brought to such large proportions within a comparatively brief period.